“Researchers develop a framework to encode mechanical memory in a featureless structure – an elastic shell. When Harry Potter and the Order of the Phoenix was translated into Braille, it spanned 1,000 pages over 14 volumes of thick Braille paper. Tolstoy’s War and Peace weighs in at 21 volumes. But what if there was a way to store whole books in just a few pages of Braille? Researchers at the Harvard John A. Paulson School of Engineering and Applied Sciences (SEAS) have developed a framework to encode memory, in the form of Braille-like dimples and bumps, onto a blank, lattice-free material. The set-up is beguiling in its simplicity, said Mahadevan. First, the thin elastic shell – shaped like a slightly curved ruler — is compressed by a force on each end. Then, indents are made using a simple stylus, in much the same way that the pages of a traditional Braille book are printed. The shell will “remember” the indent when the force is no longer applied and the indent can be erased by stretching the shell back out. 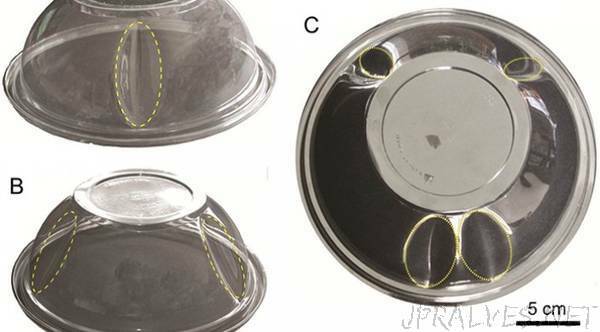 “Simple experiments with cylindrical and spherical shells show that we can control the number, location, and the temporal order of these dimples which can be written and erased at will,” said Mahadevan. The concept for the system was first envisioned by Mahadevan using a simple inverted fruit bowl. This is the first time that researchers have demonstrated mechanical memory in a system with no inherent lattice. The approach is also scale-independent, meaning it will work with one-atom-thick graphene all the way up to paper. “This paper is a first step in showing that we can store memories. The next step is to ask if we can actually compute with them,” said Mahadevan.